Bluetooth speaker, wireless speaker, TV soundbar. 20W 3D stereo surround sound, deep bass. Crystal clear and fine-sounding audio supported by dual 10W drivers. Wireless Subwoofer, Digital Signal Processing (DSP) system with high-fidelity sound system. Incredible amazing sound with 3D surround sound High-Fidelity sound system, perfect for home, partying, camping! uWorld wireless soundbar for TV is special with one side is gray fabric and the other 3 sides smooth and shining. This TV sound bar is outstanding and eye-catching. Bluetooth speaker output power is 20W; 2 speakers of 360° stereo sound and smart sleep mode. 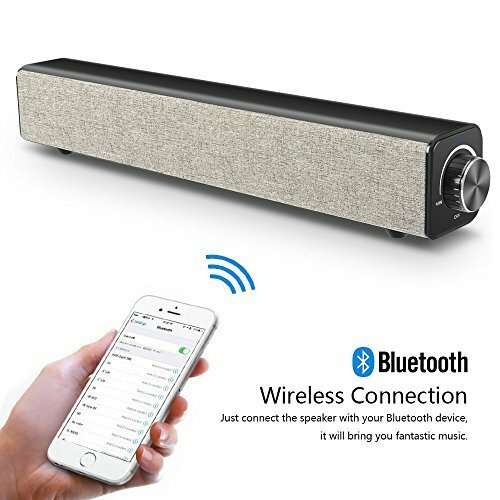 All the merits let our bluetooth speaker perform perfectly among other sound bar speakers. This blue-tooth computer speaker has a strong compatibility with all smart phones, tablets, computers and all other devices which support Bluetooth 4.0. The soundbar speaker is best for music, movie for party, meeting, camping, indoor and outdoor activities!